When the human’s away, the cats and dogs will play. No matter how big or small, young or old, your fur babies rely on you to make sure they’re safe at home. 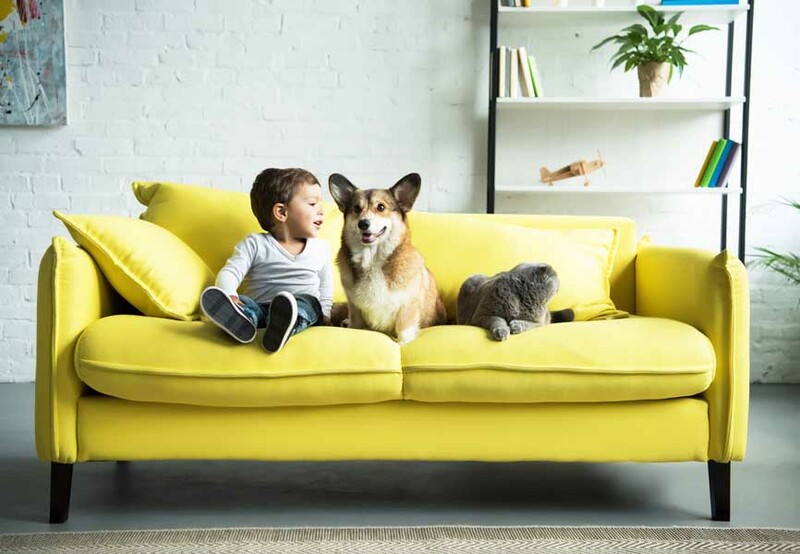 We’ve pulled together some handy tips and a room-by-room guide to help pet proof your space. Whether you’re bringing home a new puppy or kitten, or simply want to do a quick pet safety check, it’s best to start with the basics. Scan your home for loose or dangling cords, small toys, or objects that could pose choking hazards, and items that should be out of reach, like poisonous plants (including in your garden), cleaning products, and anything else that may be tempting for pets to get their paws into. Once you’ve taken care of all the small things, you’ll want to do a room-by-room check. 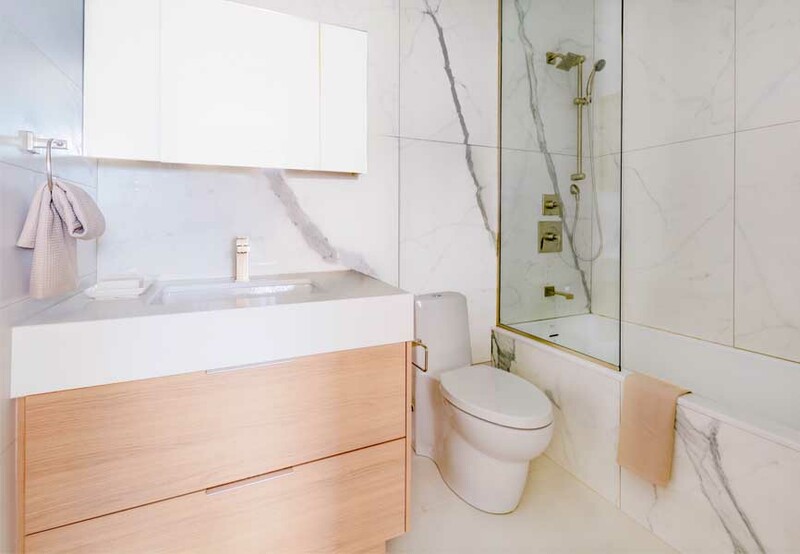 Making sure the toilet seat is down, using childproof latches on drawers and cupboards, and tucking away shoes are things you’ll want to think about. And if you have a new puppy (meaning everything is a possible hazard), consider getting a puppy or baby gate to keep them in, or out of, specific areas. • Toys and games: If you have kids, this is a great way to teach them to put their toys away (because if they don’t, they might become pet toys)! Try storing toys and games in bins that close or on high shelves in a bookshelf. This preserves the toys and keeps them from becoming choking hazards for pets. 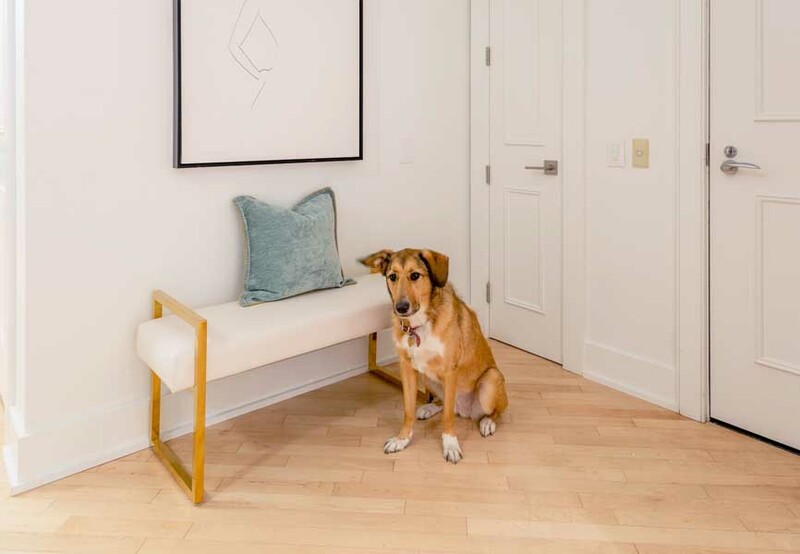 • White or light carpets: Light coloured carpets can make a space feel airy and light, but it might be best to keep them out of rooms that your furry friends will be in. If you have a white shag rug in your living room, consider gating pets out while you aren’t home. And while puppy training is happening, it might be worth rolling it up for a few months to avoid stains. o Hide cords behind artwork. o Use a staple gun to guide a cord along a wooden table or desk. See how Love Grows Wild does it. o Hide cords in decorative drawers or boxes. *Hack – wrap them up and put them in toilet paper rolls for a neat storage solution! o Use a shower curtain rod cover or foam pipe insulation to hide and protect wires. • Clothing: Clothes are usually stored in closets or drawers already, but socks and underwear in particular can be targets for chew toys. So if you have these items stored in open bins, consider placing them in the closet or investing in bins with lids. • Shoes: Tuck shoes away – it’s not worth having them get chewed! IKEA has lots of shoe storage cabinets that can help with this one. • House plants: It’s surprising how many house plants are actually dangerous to our furry friends. Check out this list of poisonous house plants to give away or move to a higher shelf. • Lotions, perfumes and cosmetics: If you keep cosmetics and lotions on a desk in your bedroom, consider tucking them away in drawers. If you have a high dresser, store them on the top surface or clear out a drawer to be extra safe. • Small spaces: Cats have this skill where they’re able to locate and hide in the smallest of spaces. To avoid this, look around and block small nooks or holes inside cabinets or behind your washer and dryer. • Candles: While candles are great to have around because we love the smell, so do our pets. It's important to remember to put them away when you blow them out. And while they’re lit, make sure they’re on a high surface to avoid getting knocked over. • Cleaning products: Cleaning products like dish soap, dishwasher pods and bleach should all be stored under your kitchen sink so they’re easy to grab for you, and hard to get at for your pets. 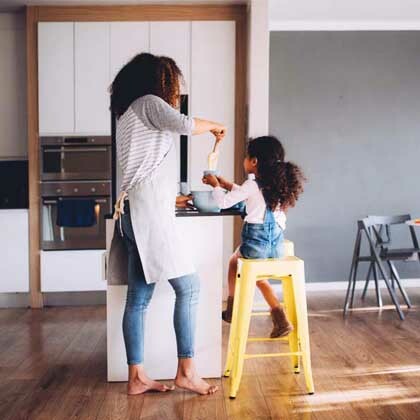 • Spices: Spices should be placed in an upper cupboard or drawer near your stove for convenience – but if they’re in a drawer beside your stove, make sure to use a childproof latch to keep curious sniffers out! • Knives: Keeping a knife block on the counter is a great way to store knives in the kitchen, but it can be dangerous with pets around. Consider moving your knives to a locked drawer or put your knife block in a cupboard to keep it hidden. • Trash cans: When you have furry friends, it’s best to ensure your garbage and recycling bins have latch lids or are stored in drawers. We recommend Simplehuman trash cans – they offer a ton of different styles and have reasonable price ranges and high ratings on Amazon – win, win! • Food: This seems like an obvious one – but we thought we should mention the important food items. Did you know that avocados are actually poisonous to your pets? o In addition, you’ll want to make sure all chocolate, grapes and raisins, onions, garlic, macadamia nuts and caffeine products are all put away in cupboards or the fridge. If you want to be sure you know what your pet can or can’t eat, make sure to do some research, because it changes depending on the animal. • Cleaning products: Similar to the kitchen, ensure your laundry soap and other cleaning products are stored under your bathroom sink or in your bathroom or laundry room closet. • Medications: These are good to keep in a high shelf (if stored in your kitchen) or in a medicine cabinet in your bathroom. Typically a high shelf is a good spot for medications! • Shampoo, conditioner, and lotions: If you have a shower caddy that’s up high, you’re set. But for the ones that span from the top to the bottom of your shower, you might want to consider moving your lotions and shampoos to the top. • Razors: Another thing to make sure is at the top of your shower caddy – razors! These can be dangerous for pets to chew on. • The toilet: It’s important to make sure the toilet seat is kept closed. Think about all the chemicals we clean our toilets with – we don’t want those chemicals ingested by our fur babies! The bottom line? 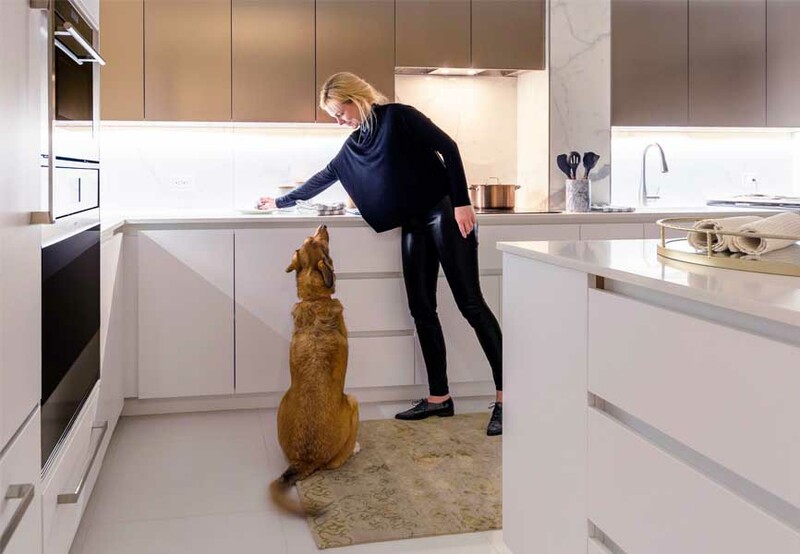 Pet proofing your home is actually pretty easy and always a good idea. As they say, it’s better to be safe than sorry! Pssst - we’re on Facebook and Twitter, so let us know if you have any pet proofing tips and we’ll add them to our post. We love pets! 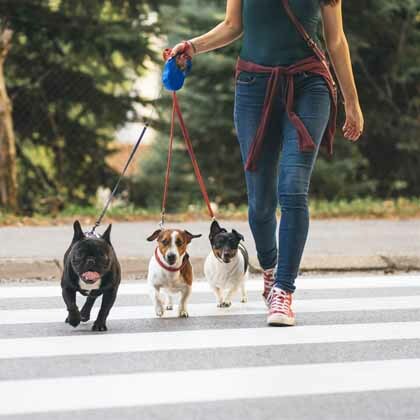 All of our Minto Apartments located in key cities across Canada are 100% pet friendly – so send us pet photos or questions about our pet friendly apartment rentals, we’re always happy to chat.